My first development role was in the world of higher education fundraising, in which I spent most days connecting with our alumni, welcoming our most adored donors to various campus events, and otherwise donning miscellaneous royal blue outfits to show my enthusiasm for the university (one of my favorite parts, I might add). As an eager young professional, I was ecstatic when my then-supervisor bought my ticket and sent me away to the Lilly School of Philanthropy in Indianapolis, a weeklong conference literally known as THE fundraising school within the industry. When I walked into the room on the first day, I saw her. You know her. She was a true professional in her gold-buttoned blazer with perfect accessories. Her shoulders were back; she was poised and confident, all while wearing one of the most genuine smiles I had ever seen. People were drawn to her and I immediately wanted to be just like her in twenty-five-ish years. Luckily for me, Wonder Woman (whose name I learned was Margot) would be leading the week’s sessions. For five solid days, I took notes and learned from Margot’s extensive career in fundraising. On the final day of the conference, we discussed networking. It was hard to think of Margot being anxious about working a room, but she soon described spending years terrified of events. One day, just before an event at one of the city’s finest museums, she had enough and was exhausted from her floundering attempts at networking. Suddenly, a thought came to Margot. “What if I pretend this is a dinner party at my home? 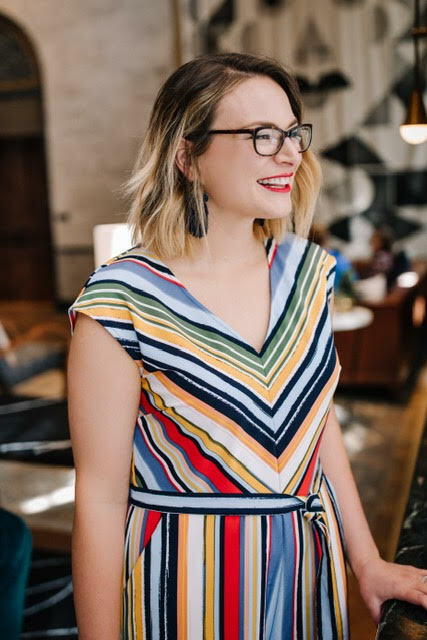 I’ll pretend the people in the room are dear friends and it is my goal to make them feel welcomed.” From then on, Margot buzzed around the room at events, talking to those on the outside perimeter, including everyone in the conversation and genuinely building relationships. I have to believe Margot’s ability to network well played an extensive role in her successful career. Over the years, I’m occasionally reminded of Margot’s dinner party advice as I’m standing in a doorway about to walk into an event in which I don’t know a soul. As a result, I’m sharing a few takeaways I have learned by applying Margot’s theory. Talk to people. I know, this sounds funny, but in a room full of strangers, we all get a little squirmy. When we picture the event as a dinner party in which “I am the the host and all these people gathered together because of me,” our perspective changes. We want to genuinely engage with each person, if not everyone we come in close proximity with, igniting meaningful conversation and inviting others into the discussion. Lead with who you are, rather than what you do. Do you remember “Bob Vance, Vance Refrigeration” from The Office? No matter whom Bob introduced himself to or where he was, he would attach his business name to his first impression. While no one was left guessing what line of work Bob was in, I’m not sure this is the best approach for us at events.When we are meeting new friends in a social setting, we rarely say our company name in the same breath, but rather first get to know each other on a relational level. Memories of our kids’ recent trip to Disney, a funny comedy of errors story, or other unforced, natural topics allow rapport and trust to be built (and are much more memorable!). Certainly, it’s important for us to leave folks with a card and a clear understanding of what you do, but people are going to remember how you made them feel rather than what your company specializes in. Plan ahead. When hosting a dinner party for friends, you reserve the date on your calendar, research the venue and invite guests in advance. Closer to the date, you consider attire and appropriate dress. The same steps apply when prepping for networking events, as well.We should intentionally schedule events on our calendar, invite others who would benefit from the event and even consider minor details ahead of time. There is nothing worse than running around the house 30 minutes before an event steaming your blouse and double-checking where you can find parking. Considering these details in advance will ensure you are calm and collected when arriving. Greet everyone with authenticity. 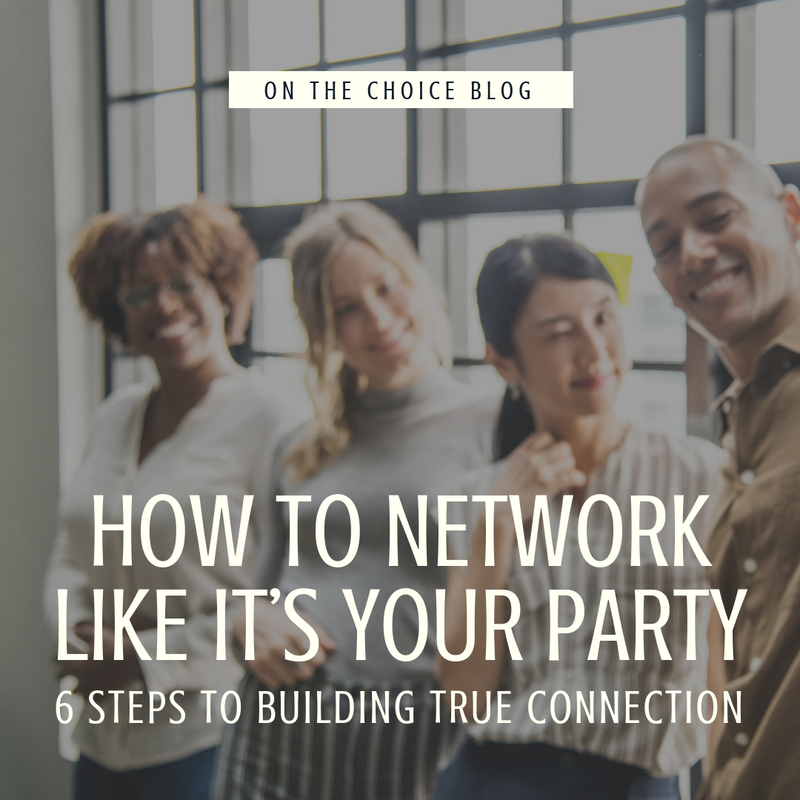 While it is wise to look over the guest list, considering potential leads or great connections before the event, conversations go much further when the other person doesn’t feel like you have a motive. When someone discovers your values organically through the course of a conversation, they will feel much more comfortable trusting you with their next business project or introducing you to someone in their network. Go out of your way to serve. During a dinner party at my home, I’m welcoming guests, ensuring everyone has something to drink or eat and otherwise serving before I serve myself. Oftentimes, we go into networking opportunities with our own selfish intentions. Internally, we are hoping to find someone in the crowd who will ultimately do X, Y, or Z for us. But, when we consider serving others before serving ourselves, the outcomes change and we find that folks with similar values are interested in working with us.At a morning networking event, ask if you can get anyone else a coffee when you make your way to the refreshment area. Offer to connect a new contact with someone who would benefit from his/her service or be a great mentor for him/her. Suggest other opportunities in your area they would love. Maintain the relationship. How many times have you had a friend over to your home and then never spoke to them again? Hopefully, never. Similarly, the idea here is that you treat each (true) connection at an event as a new friendship. You follow up quickly by email or a handwritten note, expressing your appreciation for their time and conversation. Next, you might connect on LinkedIn or ask for a coffee meeting to stay in touch.I can’t tell you how many times I text my friends things that remind me of them, from funny Enneagram memes to the most recent toy recall. Similarly, when I see an article, industry news or other appropriate information that reminds me of the person I spoke with or our conversation, I will share the link via email with a quick note explaining how I hope the resource is helpful, how I found it funny or otherwise connect it back to our conversation. So many of us loathe networking because A) it’s uncomfortable and B) it feels so fake and ingenuine. However, we have the ability to control both of those emotions. By being comfortable, acting genuine and treating others with authenticity, our networking shifts from self-promotion to true connection. What networking events are on your calendar this quarter? How can you implement one or two of these tips at your next event?